Twitter is one of the social media and micro blogging platform that very popular today. According to www.twellow.com user of twitter is reaching 10 million users worldwide, with 4 most popular twitter is Ashton Kutcher (3,945,588 followers), Britney Spears (3,725,547 followers), TheEllenShow (3,687,260 followers), and CNN (2,801,135). With so many users, it may be very difficult to manage twitter followers, who do follow you and whom are followed by you? If you are a twitter user with hundreds, thousands, even millions followers and want to manage your twitter followers you can use twellow (www.twellow.com). How to sign in with twellow? 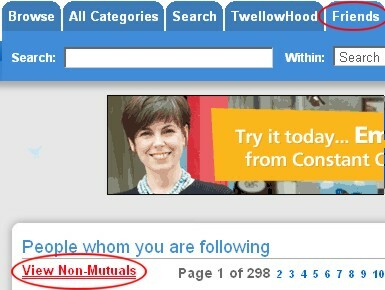 You can easily sign in twellow with your twitter account so you don’t need to register first with twellow. How to see people whom are following by you and don’t follow you back? Click at “friends” then click at “view at Non-mutuals”. You will see people who don’t follow back and you can manage them by still follow them or remove easily them with “remove” button at right beside twitter account at twellow. How to see people who are following you and you don’t follow you back? 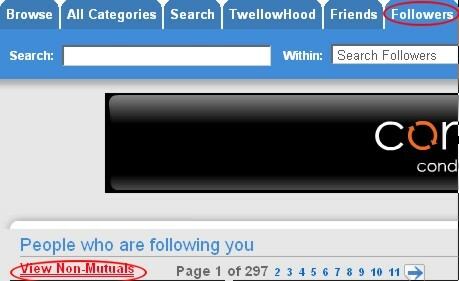 Click at “followers” then click at “view at Non-mutuals”. You will see people who follow you but you don’t follow back. You can decide to follow them or still don’t follow them by click at “follow” button right beside twitter user at twellow. With this twellow feature to manage twitter followers and twitter friends by viewing non-mutual friends can greatly reduce time to manage your twitter account, even if you have hundreds, thousands, and millions followers. Twellow can be visited at www.twellow.com.